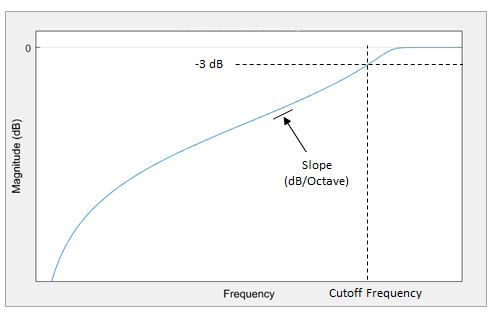 Equalization (EQ) is the process of weighting the frequency spectrum of an audio signal. 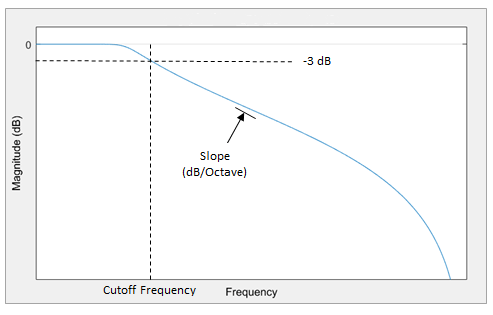 Lowpass and highpass filters –– Attenuate high frequency and low frequency content, respectively. 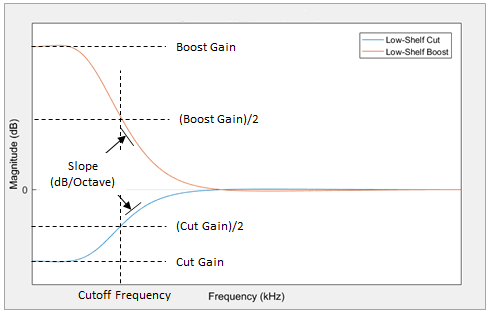 Low-shelf and high-shelf equalizers –– Boost or cut frequencies equally above or below a desired cutoff point. 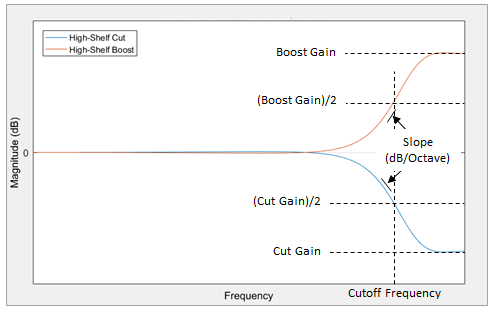 Parametric equalizers –– Selectively boost or cut frequency bands. Also known as peaking filters. Graphic equalizers –– Selectively boost or cut octave or fractional octave frequency bands. The bands have standards-based center frequencies. Graphic equalizers are a special case of parametric equalizers. This tutorial describes how Audio Toolbox™ implements the design functions: designParamEQ, designShelvingEQ, and designVarSlopeFilter. The multibandParametricEQ System object™ combines the filter design functions into a multiband parametric equalizer. The graphicEQ System object combines the filter design functions and the octaveFilter System object for standards-based graphic equalization. 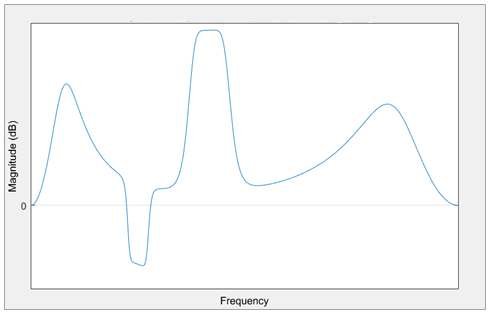 For a tutorial focused on using the design functions in MATLAB®, see Parametric Equalizer Design. Use designVarSlopeFilter to create lowpass and highpass filters. Use designParamEQ to create parametric equalizers. You can design single-band parametric equalizers or a cascade of parametric equalizers. Using a cascade of parametric equalizers enables you to tune your frequency response with precision. For parametric equalizers, the analog prototype is reduced by setting the bandwidth gain to the square root of the peak gain (GB = sqrt(G)). ω0 is the desired digital center frequency. This transformation doubles the filter order. Every first-order analog section becomes a second-order digital section. Every second-order analog section becomes a fourth-order digital section. Audio Toolbox always calculates fourth-order digital sections, which means that returning second-order sections requires the computation of roots, and is less efficient. The digital transfer function is implemented as a cascade of second-order and fourth-order sections. The coefficients are given by performing the bandpass bilinear transformation on the analog prototype design. Denormalizing the a00 coefficient, and making substitutions of A =sqrt(G), ΩB≅α yields the familiar peaking EQ coefficients described in . Orfanidis notes the approximate equivalence of ΩB and α in . where B plays the role of an equivalent octave bandwidth. To design lowpass and highpass filters, Audio Toolbox uses a special case of the filter design for parametric equalizers. In this design, the peak gain, G, is set to 0, and GB2 is set to 0.5 (–3 dB cutoff). The cutoff frequency of the lowpass filter corresponds to 1 – ΩB. The cutoff frequency of the highpass filter corresponds to ΩB. The table summarizes the results of the bandpass bilinear transformation. 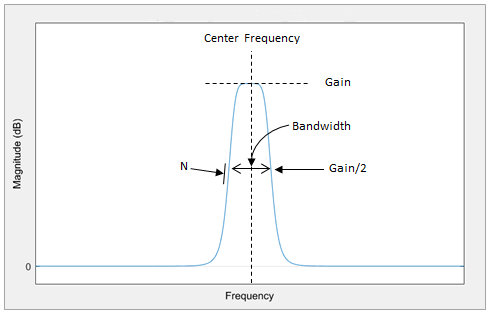 The digital center frequency, ω0, is set to π for lowpass filters and 0 for highpass filters. The table summarizes the results of the bilinear transformation with prewarping. Orfanidis, Sophocles J. "High-Order Digital Parametric Equalizer Design." Journal of the Audio Engineering Society. Vol. 53, November 2005, pp. 1026–1046. Bristow-Johnson, Robert. "Cookbook Formulae for Audio EQ Biquad Filter Coefficients." Accessed March 02, 2016. http://www.musicdsp.org/files/Audio-EQ-Cookbook.txt. Orfanidis, Sophocles J. 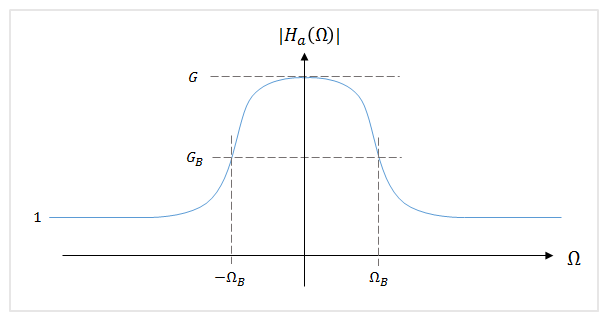 Introduction to Signal Processing. Englewood Cliffs, NJ: Prentice Hall, 2010. Bristow-Johnson, Robert. "The Equivalence of Various Methods of Computing Biquad Coefficients for Audio Parametric Equalizers." Presented at the 97th Convention of the AES, San Francisco, November 1994, AES Preprint 3906.